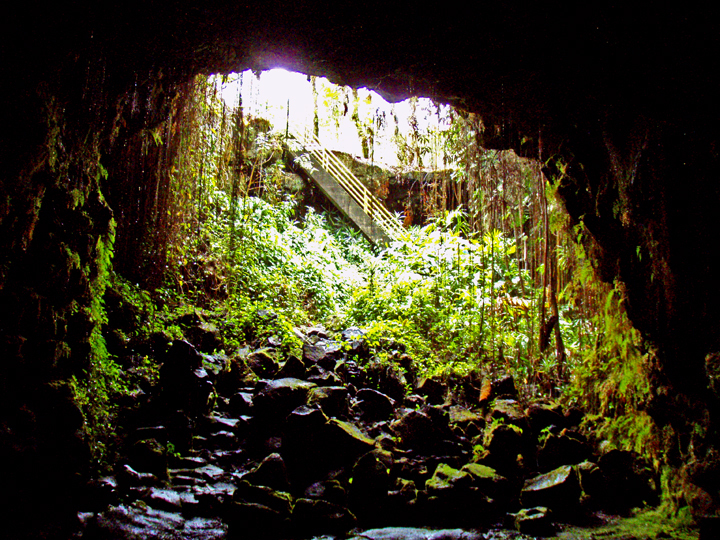 A skylight opening in the 25-mile long Kaumana Cave is located at this county park, just west of the 4-mile marker on the Hilo side of the Saddle Road (Hwy 200 or Waianuenue Avenue). 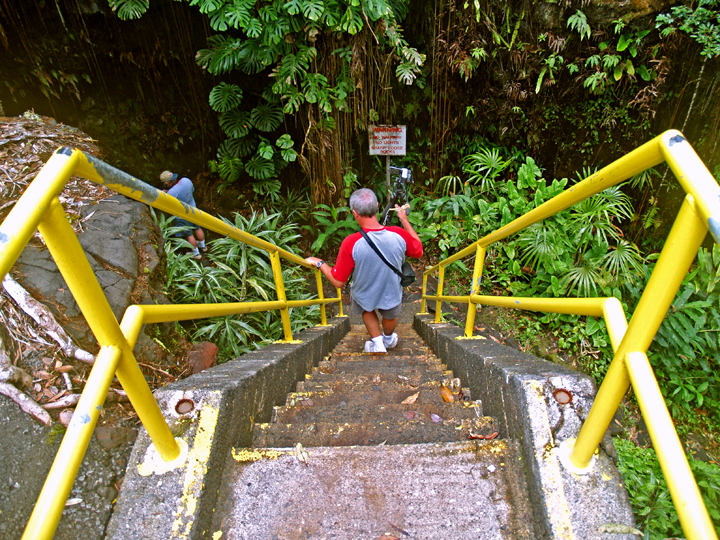 Concrete stairs take you down through the fern, philodendron and rain forest jungle to the floor of the cave at the bottom of a collapse pit, which also forms two entrances to the cave. 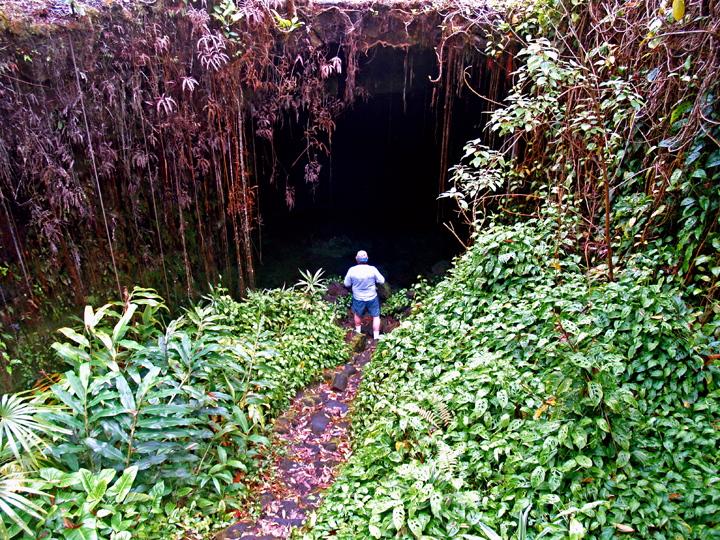 Even the casual visitor will be fascinated exploring the openings to these caves, which are cool and welcoming during hot weather, and dry (or ”drier” at least) when rain pours in Hilo. 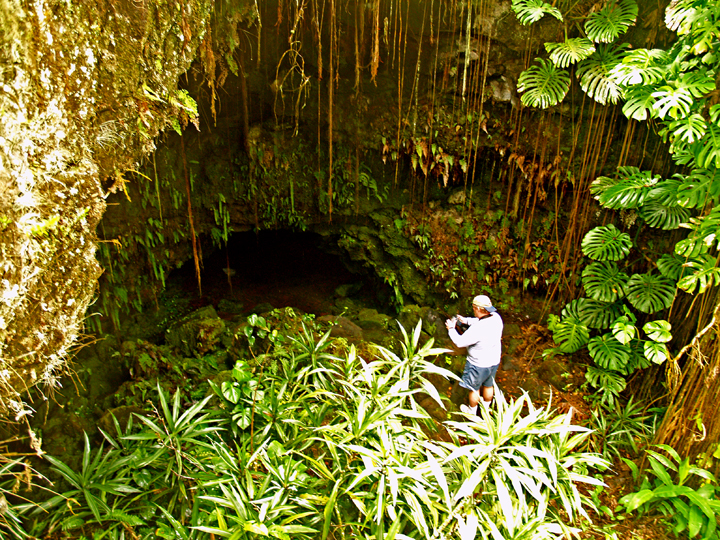 The lava tube was created by a flow from Mauna Loa in 1881 that threatened the city of Hilo. 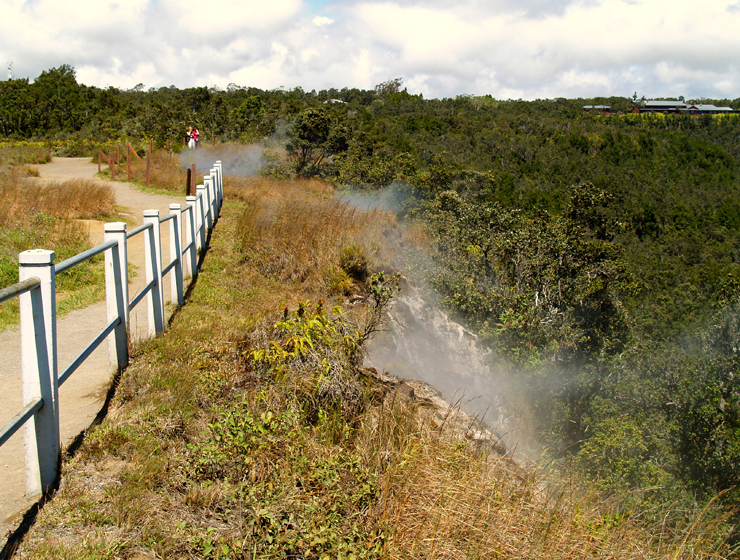 History has it that Princess Ruth Ke`elikolani camped directly in front of the advancing lava flow and stood praying, beseeching the goddess Pele to spare the city. The flow stopped a scant 2 km from the city, so it would appear that her prayers were answered. Most people are drawn to the entrance on the right, a large, opening leading to cavernous rooms. 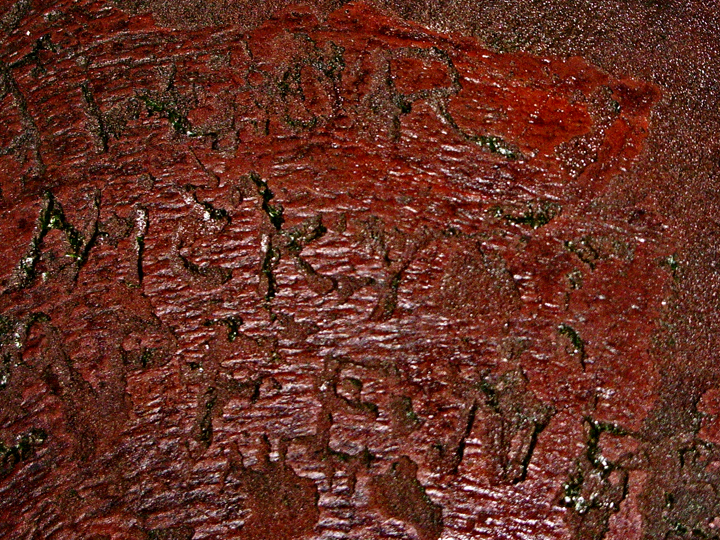 In this entrance, graffiti from hundreds of years ago to the present is preserved, scratched into the rocks. The entrance on the left, however, is more interesting, leading through squeezes and low spots to numerous rooms with fascinating speleo-architecture and cave formations. The average visitor will want spend their time in the lighted openings of the caves, which go to true dark in fewer than 300 feet in either direction. A quick tour of the caves, for which no flashlights are needed, takes fewer than 20 minutes. 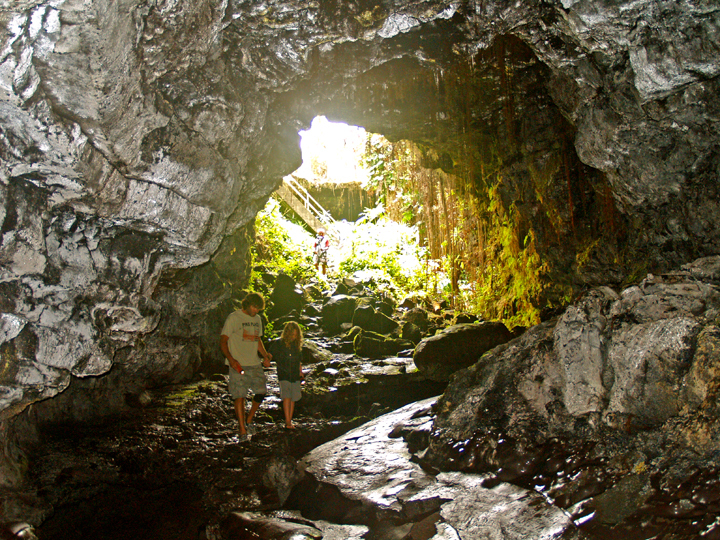 For the adventurous, there are more than 2 miles of easily accessible, wild cave to explore here. If you intend more than just a cursory inspection near the entrances, bring a hard hat, water and at least 3 sources of light. 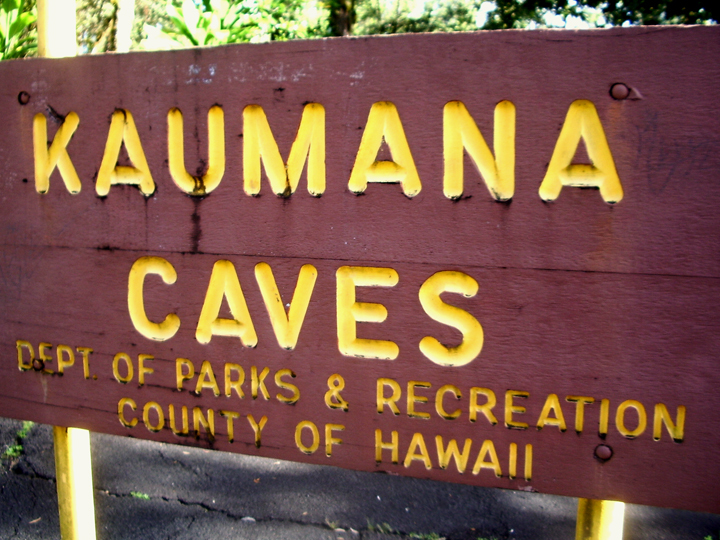 The caves open onto private land—the County of Hawaii requires you to get prior permission of landowners and sign an assumption of risk waiver (available at the cave) before exploring deeply into these caves. A brief discussion of exploring Kaumana Cave more deeply, including a list of equipment and clothing to bring and discussion of risks, is contained here. Parking for the caves is located across the road from the park; extreme care should be taken when crossing the highway. Public restrooms, drinking water and picnic tables are available at the park. 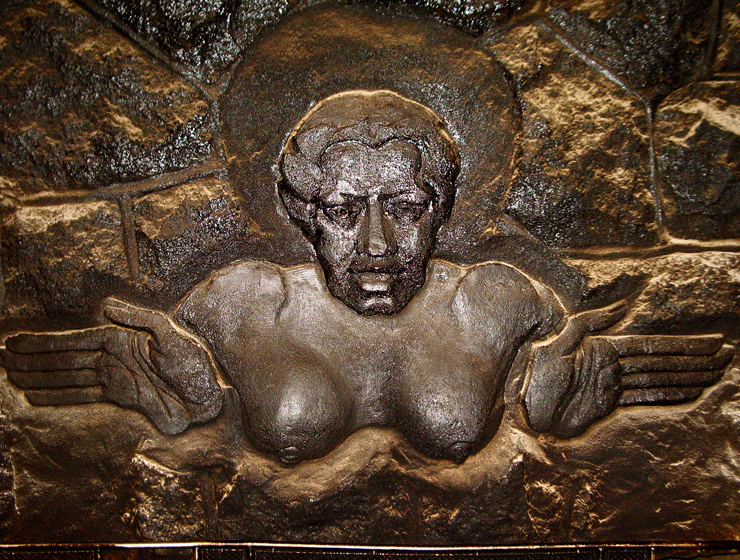 Polynesians encountered the snow goddess, Poliahu, for the first time when they reached the Big Island of Hawaii sometime in the Fourth Century C.E. and beheld the snow-clad summits of the great volcanoes. 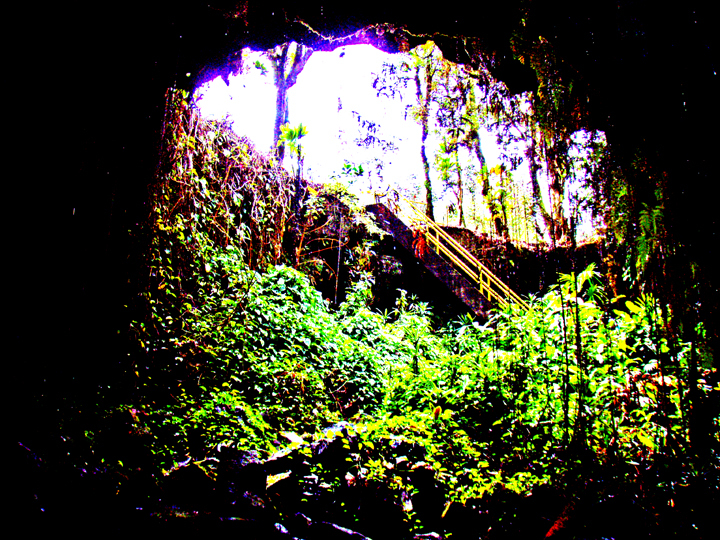 The eldest daughter of the sky god Kane, Poliahu is said to have created the verdant, tropical beauty of the Hamakua Coast on the Big Island; its lushness, clear, cold streams and lovely waterfalls a perfect playground for her to indulge in her favorite pass-time–cavorting with human men. 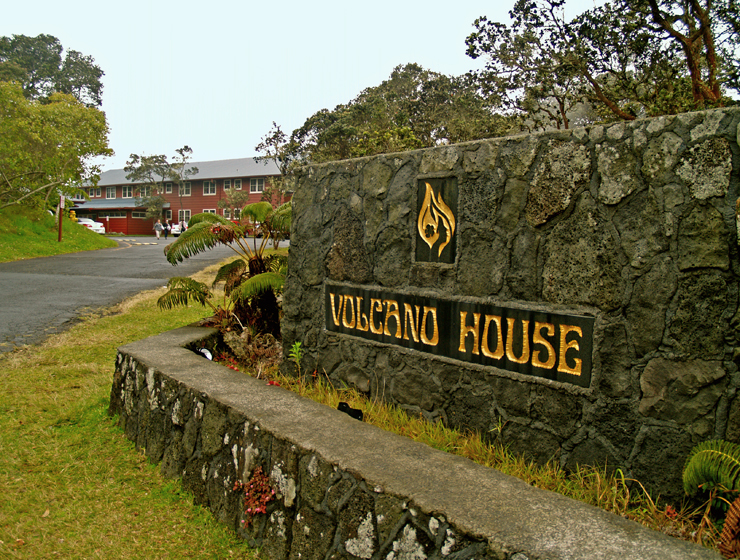 Though she regularly visits Haleakala on Maui and Mauna Loa on the Big Island, Mauna Kea–in Hawaiian the “White Mountain”–is rightly considered the home of Poliahu. The prominent surviving myth about the Goddess Poliahu involves her besting the Volcano Goddess, Pele, at the Hawaiian sledding sport of “he’eholua”. 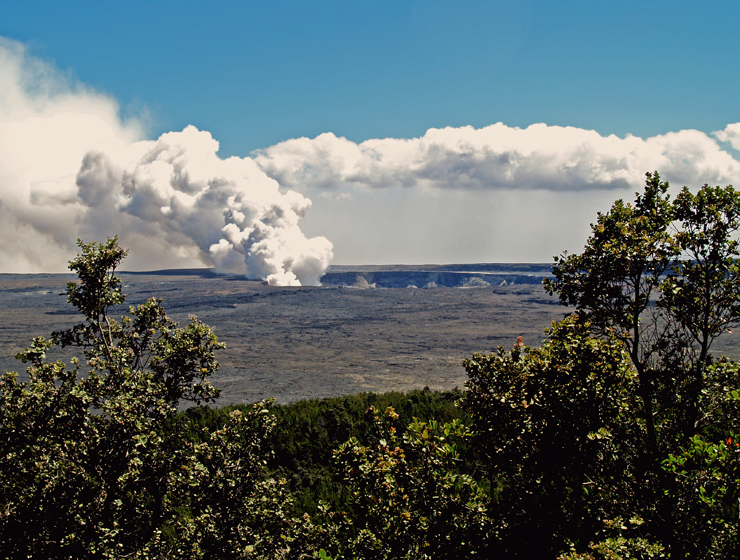 So angry was Pele at being defeated that she attacked Poliahu with streams of glowing lava. 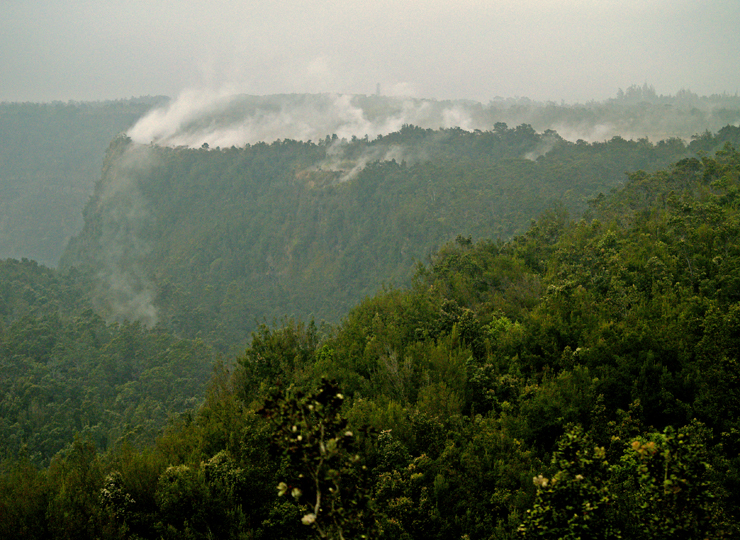 Poliahu retaliated by bringing down storms of snow to freeze the molten rock in place. The goddesses fought each other to a standstill, although the sledding defeat has always rankled Pele. 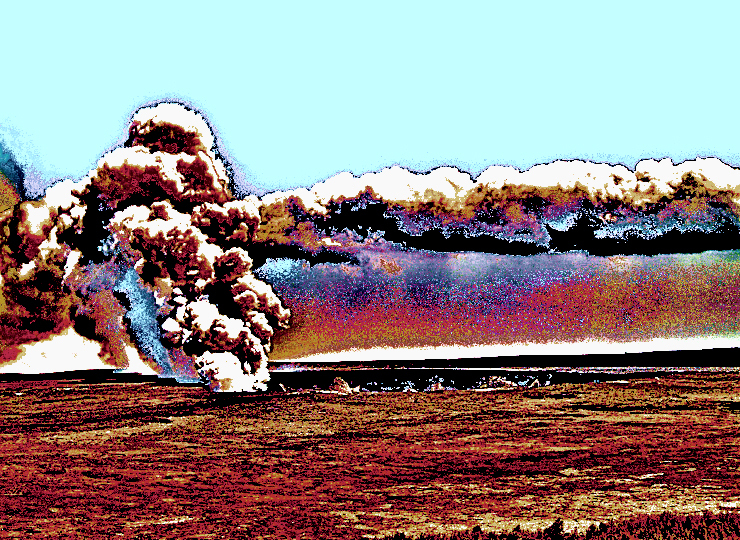 Even now as she dominates at Kilauea, Pele submits to Poliahu’s rule on Mauna Kea; still, to this day, Pele is said to dispute with Poliahu over Mauna Loa. Mythology aside, Mauna Kea’s summit is an exciting, fascinating place. A dormant shield volcano which hasn’t erupted for about 4500 years, Mauna Kea is 13,803 feet tall, the highest point in the state of Hawaii. 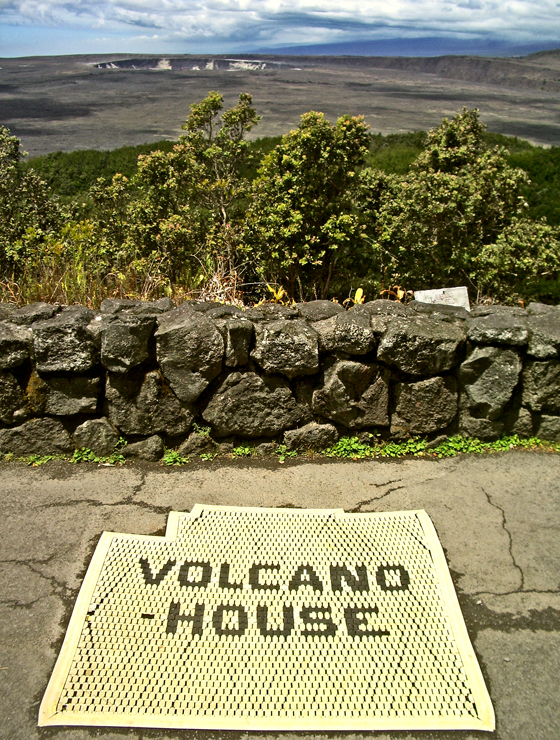 Because the summit rises some 33,476 feet above its base on the sea floor, Mauna Kea is the tallest mountain on earth. All this mass, this huge bulk of a mountain has grown in fewer than a million years–geologically the blink of an eye. Glaciers covered the summit of Mauna Kea three times between 200,000 and 13,000 years ago, leaving behind many glacial features and a few remnant rock glaciers near the summit. In addition, the summit area is home to Lake Waiau, the seventh highest lake in the United States. Also on the summit block is the largest, and most modern collection of international astronomical observatories located anywhere on earth. I love visiting the summit of Mauna Kea–whether I spend the day hiking the six-mile trail to the top or I drive to the end of the road for the 10 minute walk up the summit at Pu’u Weiku. I spend hours and hours watching the clouds, listening to the silence, soaking up the island-wide vistas. I’m not sure what draws me out of the tropical torpor of Kona, time and again, to the summit of Mauna Kea–maybe the exhilaration of altitude and the crisp, clean air, or the opportunities for snow-play, solitude; perhaps unconsciously I hope to see one of the legendary cat-fights between Pele and Poliahu, fire and ice. Secretly, deep down, I suspect that honestly I am just hoping to become yet another in the long, long line of human men that Poliahu has chosen to, ahem, cavort with. 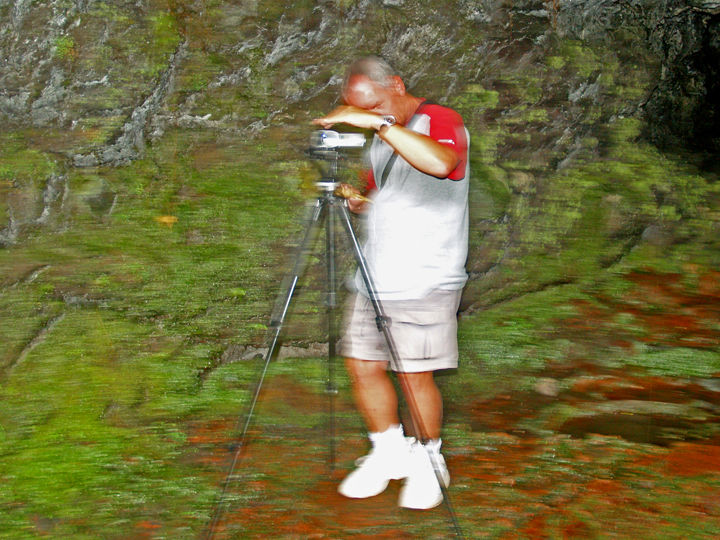 For more information about traveling to the Hawaii in general and touring the Big ISland in particular, please visit www.tourguidehawaii.com and www.tourguidehawaii.blogspot.com. 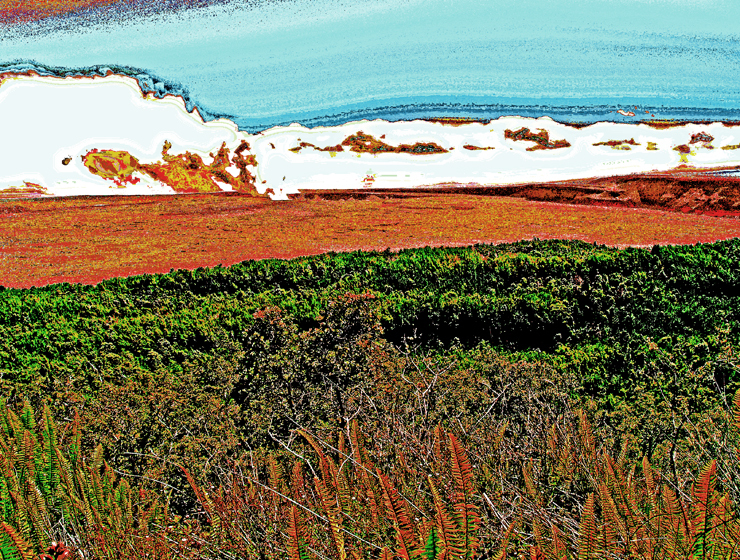 For a video about hiking up Mauna Kea, go here. For information about the author, please go here.